I know I’m gonna go against convention wisdom here. People may think I’m crazy or they’ll be p.o.’d that they spent money doing this the wrong way. I know, I can hear you now. “A friend of a friend’s grandpa said this was the way to do it!” Or,”The handyman who touches up paint or built those shelves out in the garage said this was how you do it!” Well, they are wrong, alllll wrong. Most likely they told you to put insulation between the joists in the floor of your first floor/ceiling of the basement or crawlspace. 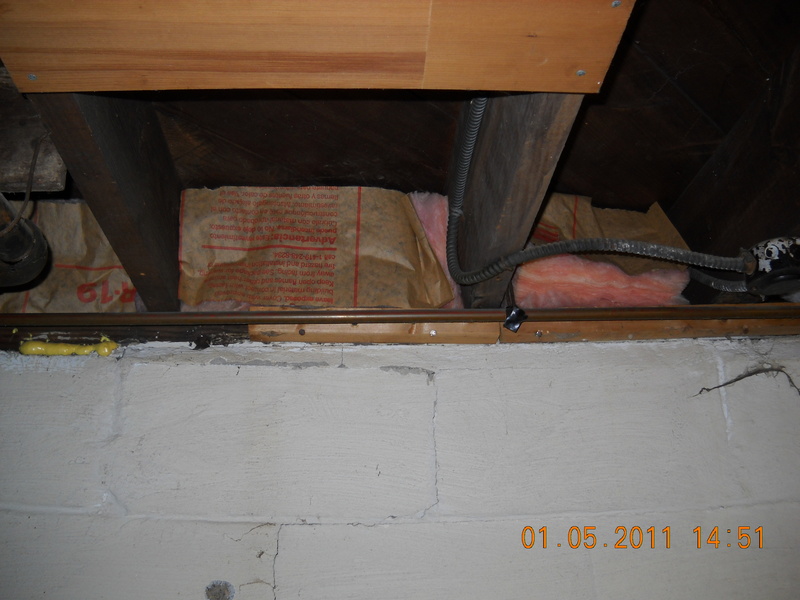 The crawlspace is a whole other post which 90% of homes get completely wrong in my humble home inspector opinion. I’ll deal with this later. For now we are going to go over a little know aspect of home insulation. The attic is child’s play. I expect more out of myself for my readers. One vent I had installed to supply heat to the basement. I have four total openings to warm the basement. To start with, I don’t think I’m going out on a limb if I say we can all agree that heat rises? If you aren’t with me at this point just find a blog about what Lindsey Lohan or Justin Bieber is up to and leave me alone. Back to said heat rising, if we cut off any airflow between the basement and the first floor the only thing that will happen is heat will rise and there will be a big temp difference between the floor and your thermostat where it is mounted on the wall. Trust me, this was happening at my house and cold feet are unhappy feet! The floor temp was 60 degrees and the thermostat was set on 68 degrees. By insulating the floor you are also actually not helping to keep any heat IN the house. “But Travis, the basement is cooooold and it feels like it comes up through the floor and makes my tootsies cold!” That brings me to the second point, you need to get some open heat vents directing heat into the basement area. If you think about it, and I do because that’s how I roll, you really need less heat output to the second floor of your home and more to the basement and first floor. This is where most of us spend the most time while awake at our casa. This is the rim joist area at the top of the basement wall. Now, where to insulate since you are asking? The rim joist is the first spot. Along the top of the wall in the basement above the wood sill plate there will be spaces where you can cut pieces of foam board or fiberglass insulation to fill in the space. If it is foam board try to fit it in snuggly. If it is fiberglass, it should fit in and stay without falling out but not be packed in there. If you pack it in tight it will lose its fluff and insulating capabilities. The next spot? Your basement walls! Wow, did I just blow your mind? Seems strange, huh? We all know about insulating behind walls but not on the outside of the wall. Here is the dealio and I may just blow your mind again. This tip is called the “Rule of 55”. The ground stays a constant 55 degrees at 55″ down from the ground level. This means that your basement walls from 55″ down (from ground level) and up will get very cold in the winter. Downright freezing. That is why we have to bury water lines, foundations, etc at least 48″ down below what we call the frost line (If you are in Florida or some other climate that does not get winters, well, I hope you’re happy with yourself. We’re freezing up here! Send us some oranges or peaches or something). If you insulate down from the sill plate to AT LEAST 55″ below outside ground level you will be doing a service to the heat retention and comfort of your whole home, not just the basement. If you disregard me and insulate the ceiling of the basement, you will have a very cold basement and a cold floor on the first floor (again, the feet!) and you deserve it. This also keeps the basement from being isolated from the house and holding in moisture which is also not good for the house. You will get a mustier basement and could also possibly get mold and mildew growing on things. Very good article. I just used my temp gauge to see if that was true and it is. My floor is about 3 to 4 degrees colder than where my thermostat is. I have a unfinished walk out basement, pretty big. I am trying to think about and balance, can I deal with cold feet vs the expense of opening up a couple of vents downstairs and heating the whole basement. I think it’s a personal thing. I think I will where socks. Thanks for the article. Your writing is very entertaining and informing. With a walkout basement it sounds like you have a newer built home? If so, they insulate the foundation walls on the outside which is keeping your basement much more moderate than mine. That is half the battle. Also, if it is newer, there are probably some vents open to your attic that you might not know about. My house is 1923 and the furnace was from 1984. In those days they didn’t think about warming the basement at all. They were just happy to get rid of the old gravity feed furnace. I bet your basement is above 60 degrees if you keep your thermostat at 68 or up. Wow, this sure does cut against the grain of conventional practice. Challenging the status quo is nice to see occasionally. Does heating more volume of air not increase your power bill? Two things. First of all you can actually keep your heat a degree or two lower if your feet are warm and the heat is consistent from top to bottom. Heat on the feet is much more comfortable than heat at head level and cold feet. So savings there. 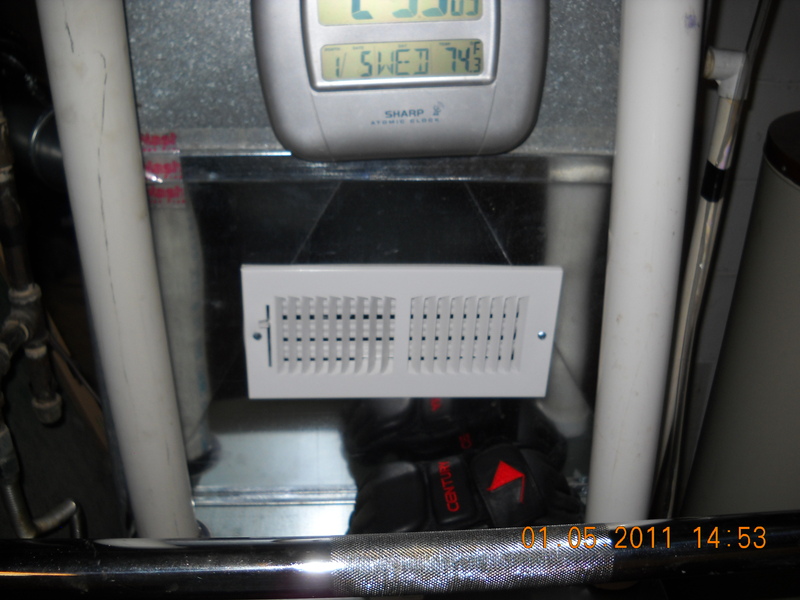 Secondly, your furnace should already be sized to take the interior space into account. If you are warming the basement air, your first floor will be warmer from top to bottom as discussed earlier and the thermostat will cycle on and off less frequently. Before I opened some vents to the basement my first floor temp on the floor was 60 degrees and the temp at the thermostat (a mere 5′ or so) was 68! BTW, where are you that you have fire ants? My Mom lives down in Key West so I have horrible experiences of those creatures! Thanks for the reply, Travis. You’ve changed my thinking on floor insulation. I’m in South Carolina. Originally from Georgia. I actually did some undergrad research in college on the little buggers. The biggest problem with them is that if you try to kill them, you take out all ants, and the fire ants are more aggressive at taking back territory. So it only temporarily fixes the problem, and they might come back worse without the competitive species around. That being said, the ones in the house are not fire ants. Not sure what kind they are, but they will nest above ground– aka in walls.